We have so many customers that need phones because their existing phone isn't compatible with headsets (eg cordless phones) or because they are setting up a small or home office that we have now added phones to our repertoire! What can the phone do? Lots of business contacts? No problem - the 750 can store up to 120 names and numbers and has 20 shortcut keys for your most common numbers. Need to plug the phone into a PABX? 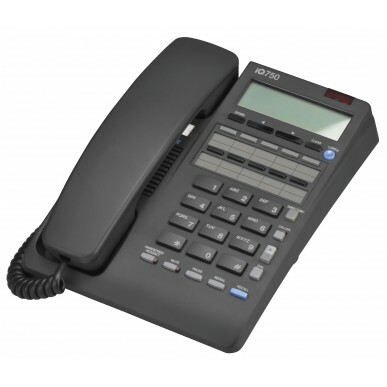 Easy - this phone is fully PABX compatible as well as plugging simply into your home phone line. Of course the phone has a display where you can see the date & time, call timer, memory contents, caller ID (where your phone provider allows) and other useful info. You can control volume of the ring tone as well as the headset and handset and a 'clickless' mute function means your caller doesn't know when you've put them on mute. There's a loudspeaker function for when other colleagues need to join in.. Hold, park and transfer calls (when used with a PABX). The iQ750 has a message lamp so (if you have voicemail via your PABX) you can see there's a message waiting for you. There's a light to tell you also when the phone is ringing when you have the ringer on silent. The phone needs AC power to use all the features above but don't worry - if you have lose power you won't lose all the info you've programmed in and can still use the basic phone functions during a power cut. The phone 'knows' when you have a headset plugged in and disables the loudspeaker. You can control the headset earpiece volume (wireless headsets have additional volume controls). There's a 'silent ringing mode' so you only hear the phone ringing in your headset - this helps reduce general office noise. You can switch the polarity for headsets - this is helpful if you already have a corded headset and one of the more common connector cables (Plantronics - Vista / Polaris, Sennheiser CSTD 01 / CSTD 08) as you won't money on different connector cables for your new phone. The supervisor mode allows a colleague to join the conversation via the handset. This is useful for training, escalations and quick conference calls.